TITUSVILLE, Florida - A 10-foot long alligator was spotted Friday afternoon strolling by a sidewalk near A. Max Brewer Memorial Parkway in Titusville, Florida. Florida Fish and Wildlife Conservation Commission officers and Titusville Police responded to the scene to trap the alligator. 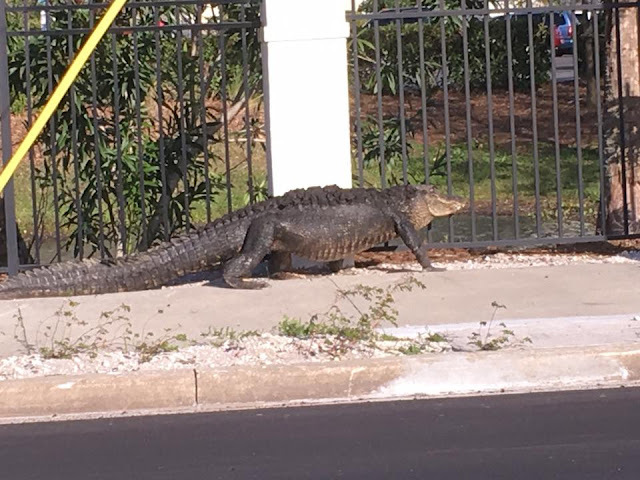 Alligator interactions with people in Brevard County, Florida are not uncommon. In 2015, a Palm Bay man was eaten by an alligator while trying to hide from Brevard County Sheriff's deputies. In 2016, a homeless man was attacked by an alligator in Melbourne, Florida. Alligators are opportunistic predators with an indiscriminate appetite that includes fish, birds, reptiles, amphibians, mammals, and even fruit. Video Credit: Ashley Moore viewer video. Photo credit: Candise Soto viewer photo.